and five children came from New York state, and with them also came the mother of Mrs. Timmerman, Mrs. Adeline Drake. The family settled on eighty acres of purchased land on section nineteen, township nineteen, range thirteen, and this farm has remained the family home until this date; where William Timmerman and his good wife, surrounded by the farm homes of their boys, are enjoying their riper years, having the love and respect of a large circle of friends. Mr. Timmerman has three hundred and twenty acres of choice Valley county land besides his home farm. He is republican in politics, a member of the Methodist church and a comrade of the Grand Army of the Republic. For four years after coming to the west, the family lived in a sod house, and a sod retreat, known as Fort Bancroft, built by the earlier settlers as protection against the Indians, stood on the farm a few rods east of his dwelling. Deer and antelope were plentiful in the country at that time and smaller game was to be found in abundance. To the men of perseverance and determination who came to Nebraska when it was yet undeveloped as all agricultural region, the present prosperity enjoyed there is due. Among the early settlers of Madison county who have been intimately identified with its development and have gained enviable reputations as citizens, may be mentioned Adolph Hille, a prosperous and successful farmer who resides on section fourteen, township twenty-four, range one. Mr. Hille is a native of Jefferson county, Wisconsin, where his birth occurred March 21, 1863, and is a son of Carl and Wilhelmina (Kluth) Hille, both natives of Germany. They came from Germany to America in 1850, sailing from Hamburg to New York in a sailboat and were twelve weeks on the sea, a much longer time than would take at the present time of traveling by water. After reaching the United States they came as far west as Wisconsin, where they settled and remained sixteen years. In 1866, our subject, with his parents, started for Madison county, traveling by ox team, the usual mode of migrating in those days, starting May 4, and reaching their destination two months later, on July 4. Upon their arrival they took up a homestead claim on section fourteen, township twenty-four, range one, which remains the homestead farm to this day, it now being the home of the subject of this biographical writing. On this land two log houses have been erected, but Mr. Hille has now built a beautiful residence, which together with the well improved farm and fine orchard, makes one of the finest homes in the community. The land is naturally rich and resourceful, it lying along the banks of the Elkhorn river, which affords it a natural supply of moisture. In the first days of settlement in this new western country, numerous hardships an privations were encountered by the brave sons who dared the unknown dangers and suffering of a new and unsettled territory. Among other discouragements met by our subject's family was that of the grasshopper pests that destroyed every leaf of vegetation for miles around during the first five years of cultivation; the crops would grow to a promising state, and along would come the clouds of grasshoppers and have their annual feast of young, tender vegetation. This was very discouraging to those concerned, but they managed by fortitude and courage, to pull through these trying periods, and lived to share the prosperity and comfort of a later period. Mr. Hille was married May 31, 1887, to Miss Fredericka Wachter, a native of Wisconsin, and Mr. and Mrs. Hille were the parents of five children, namely: Louis, Ernest, Amy, Arthur, and Alford. Mrs. Hille died June 17, 1896, deeply, mourned by her husband and children and many sorrowing friends. Mr. Hille was again married October 10, 1898, the bride being Miss Bertha Wallschlager, and Mr. and Mrs. Hille are the parents of four fine children, whose names are as follows:. Richard, William, Freda and Carl. Mr. Hille now owns one hundred and seventy acres of good land, on which are set eight acres of orchard trees, this making a fine home, where he and his family live, surrounded by a host of friends and acquaintances. They are members of the Lutheran church, and Mr. Hille is a democrat. John H. Lovejoy has always been a farmer, and before settling in Custer county, which he did at a very early date, he carried on his occupation in New Hampshire, his native state. He was born at Orford, April 8, 1834, second in the family of six children born to Enos and Mary (Hale) Lovejoy. The only other surviving member of the family is his brother, Lewis, who still lives in New Hampshire. The parents were born in New Hampshire, where they spent their entire lives. ried Charles F. Sharp, of Garden City, and they have three children; Frank E., of Custer county, is married and has three children; Amy M., wife of George W. Brown, of Sargent (a sketch of whom appears in this work), has five children; Hattie A., wife of F. Wittemeyer, of Sargent, has seven children; George C., who was accidentally killed while hunting, in 1900. In 1889, Mr. Lovejoy married (second) Ellen Sawyer, also of New Hampshire, who was an original homesteader of Custer county in that year, and she died March 6, 1894, survived by her husband. Mr. Lovejoy has always taken an active and useful part in public affairs and served in various public offices from time to time. He helped organize school district number two hundred and fifty-two and for many years served as moderator of same. He was also justice of the peace and held township offices. In earlier years he passed through the various trials and vicissitudes incident to pioneer life, and through his energy and hard work became successful as a grain and stock farmer. He is widely and favorably known in the community for his support of various worthy measures and is highly respected as a citizen. He has been a devout and active Christian for nearly sixty years and has given largely of his time and substance to the cause. December 26, 1894, Mr. Lovejoy was married (third) at Broken Bow, to Agnes J. McAllister, a daughter of James A. and Lettie (Gaily) McAllister, the seventh born of a family of eight children. Her girlhood days were spent in Indiana county, Pennsylvania. As a young girl of sixteen she came to Nebraska and resided with her parents in Gage county and then in 1888 the family moved to Custer county, where they made their home in the sod houses of that day. She homesteaded at claim in 1894 in section seven, township nineteen, range eighteen. Mr. and Mrs. Lovejoy have two children, Alice and James E., both at home. In 1907 Mr. Lovejoy retired and moved with his family to Sargent, purchasing the comfortable home where they now live. "A man without fear," is the designation of Robert William Wallace, city marshal of Hartington, given by his fellow citizens to a man who has been the instrument of the execution of the law as constable or city marshal for all but a few years since his advent to Hartington on its founding in the fall of 1893. Mr. Wallace was born near Chatham, Ontario, Canada, June 25, 1843; here his youth was spent until 1856, when his father moved to Michigan and resided two years at Ann Arbor, and then returned to his former Canadian home, and lived here until his death. Robert learned the carpenter's trade and was employed in that vocation for several years. In 1869 he crossed the national boundary again and for a year was employed in the saw mills of Bay City, Michigan, and followed the sawyer's trade at Blenheim, on the shores of Lake Erie, after returning to Canada the second time. In 1876, Mr. Wallace emigrated to Nebraska, coming by rail to Mechling, South Dakota, and crossing thence to St. James, which he reached July 16, 1876. He was employed at farm work the rest of that season, and in 1877 went to the Black Hills, where he "grubstaked" a party from Cedar county, but some of them becoming dissatisfied the entire party returned after thirty days there, although prospects were good. He resumed farm labor on his return to St. James and in 1880 found employment in construction work on the railroad then being built through Jackson, Nebraska. He was employed in this work in Nebraska, Iowa, and South Dakota for several years, and wag employed one winter making ties for the railroad north of Jackson. He was one of the surveying party which laid out the road from Sioux City to Norfolk. In 1883 Mr. Wallace removed to Hartington, bought a lot and built a house which has since been his residence. For all but six of the intervening years, he has served the public as constable or city marshal, and has proved an efficient, faithful officer of the law. His father, Joseph Wallace, was born in Ireland, near Cork, of Scotch parentage. He came to America in 1837, landing in New York after a voyage of seven weeks, and shortly after proceeded to Canada, where he was married to Mary Reardon, whose life was spent in Ontario, Canada. Mr. Wallace was married in South Sioux City, Nebraska, then known as Covington, to Miss Maria Plant, in February, 1880. She was born in Indiana and came west about 1876 to join a sister in Cedar Rapids, Iowa, who later removed to Sioux City, where Mr. Wallace and his future wife met; they have been a happy couple ever since and bless the circumstances that brought them together. They have reared and matured two boys, Walter Cramer and James Bruce Allingham, one of whom is still with them. Mr. Wallace has been a life-long democrat. His father while living in Michigan, cast his ballot for Buchanan, in 1856, before returning to Canada. Mr. Wallace is a charter member of both the Masonic and Odd Fellows lodges of Hartington; he was made a Mason in Canada in 1872 and joined the Odd Fellows there also the same year. He revisited his old home for the first time in 1906, and stopped off to visit two brothers, prominent physicians in Michigan, on his way to his sister's in London, Canada. Mr. Wallace remembers well the blizzards of October, 1880, and January, 1888; and the flood of March, 1881, when all who lived along the bluffs on the Nebraska side rendered aid to the sufferers on the low lands across the river in South Dakota. Mr. Wallace has always been fond of fine horses and has done well his part in improving western stock of that kind. He owns Acme, a fine bred horse by Alcyone, a standard bred trotter that has made excellent records on the track. His horses show well in this region of fine horses, and have left their impress for good in the state. James Vieregg, one of the leading old settlers of eastern Nebraska, in fact the very first white man to settle in Lone Tree station, went to that locality when it was in its most undeveloped state, and has resided there for the past fifty-three years. He is recognized as one of the substantial citizens of that part of the country. Mr. Vieregg was born near Probsti, Germany, December 6, 1833, where he grew up to his young manhood, and in 1852 came to America via the Gulf of Mexico in a sailing vessel, making final settlement in Iowa; then going from Iowa to California via Isthmus of Panama route, and in 1858 moved from California to Nebraska, coming overland on horseback, and settling near Lone Tree, taking up such land privileges as were afforded by the government at that time. Mr. Vieregg was one of the first, possibly the first, to settle in this portion of territory in Nebraska, and we quote the following taken from a Fourth of July address by John L. Martin, delivered at Central City, Nebraska, in 1876: "In August 1858, James Vieregg returning to the States from the gold fields of California, stopped in Hall county to visit his brother John, who had squatted there. While resting there and beholding the fertile plains displayed before him, and looking with prophetic eye forward to its future greatness, he came on down within the boundary of Merrick county, drove a cottonwood stake into the ground and lariatted his claim on what the government surveyors afterward located as the southeast quarter of section five, township eleven, range eight. This claim was located Thursday, September 5, 1858, and was the first settlement by white man in Merrick county, Nebraska. In 1858 the Western Stage company established a station at Lone Tree and erected the first building in Merrick county. Lone Tree was so called from a beautiful tree which stood alone on the prairie. The Lone Tree was three or four feet in diameter at stump height. and was twenty feet in height to the first limb; the branches were wide spreading and the whole tree was remarkably symmetrical in its proportions. It stood about eighty rods from any other tree and could be seen for twenty miles. Mr. Vieregg followed the occupation of farming and about 1870 left the farm and came into the little village of Central City to reside. He was the first county treasurer of Merrick county, holding said office for eleven consecutive years, then engaging in the grain business. In 1886 Mr. Vieregg purchased the Brewer mill built by J. G. and W. Brewer, it being the pioneer mill of Merrick county. Mr. David Martin was a partner of Mr. Vieregg, but about 1894 Mr. Vieregg became sole owner of the mill property which remained in the Vieregg family until 1907, when it was sold. Mr. Vieregg now spends a great portion of his time in Oregon, and although nearing his eightieth year is still all active man of affairs. Mr. Vieregg assisted greatly in the development of this portion of Nebraska. He was at all times all active, progressive man, and is known and respected by a wide circle of friends and acquaintances. Mr. Vieregg was married in Hall county, Nebraska, to Miss Sarah Martin, May 6, 1863. Mr. and Mrs. Vieregg have had seven children, all born in Merrick county, and five of whom are living: Nettie, wife of E. C. Fisher, has one child and lives in Basin, Wyoming; Joseph W., married, has one child and resides in Central City; Eva, wife of O. T. Bishop, has one child, and lives in Central City; Amy, wife of John Zane resides in Basin, Wyoming; and Hazel, who is completing her musical education in Oberlin, Ohio. The family of Mr. Vieregg are one of the real pioneer families of Nebraska. The son Joseph, is said to be the first male child born in Merrick county. Mr. Vieregg passed through all those early years that make history. Mr. T. J. Buckmaster first came to Knox county, Nebraska, in October, 1876, settling on a farm west of Creighton, which he had secured two years before. He came with his brother, Jasper M., who has since moved to Hot Springs, South Dakota, and others of the family came about the same time. A brother, W. W. Buckmaster, has removed to Brunswick, and a sister, Mrs. Eliza Doty, lives at Bloomfield. Mr. Buckmaster resided on his farm five years and then moved to Creighton, which has since been his home. He also owns two hundred and forty acres of land two and one-half miles from Creighton. During his five years' residence on the farm he taught school at Niobrara and during the last term was elected county superintendent of schools, serving from January 1, 1879, to January 1, 1885. Later he taught a term at Bazile Mills, and one at Verdegris. On coming to Creighton he was engaged in the livery business about nine years, and since 1900, he has been interested in real estate and insurance. our subject were Joshua R. and Mary (Young) Buckmaster, who were natives of Pennsylvania, the former died in Iowa, and the latter in Ohio, the mother passing away when our subject was quite young. The marriage of Mr. Buckmaster was solemnized at Jessup, Iowa, in January, 1875; the bride, Miss Mary E. Thomas, was born in the southeastern part of Iowa, whither her parents, Henry and Sarah Thomas, had moved when that country was sparsely settled. Mr. and Mrs. Buckmaster have one child living: Maude L., wife of Milford Kyle, a jeweler of Creighton; they have one son named Marvin W.
Mr. Buckmaster served nearly twenty years on the county board, and while teaching in Niobrara in the early days, was appointed justice of the peace against his wishes; after dismissing the first case brought before him, he resigned. He served as collector two years, and a like period as township treasurer. During the time of his incumbency of the superintendent's office, he saw the schools of the county increase from sixteen districts, one of which is in what is now Holt county, to eighty-five. At that time there were only three frame school houses in the county, those at Niobrara, Blyville, and Bazile Mills; the others were sod or log buildings, and school was held in some districts in a dugout. This was all open country in those days with deer and antelope still roaming the prairies. The famous "rustlers," Kid Wade and Doc Middleton, were running off stock throughout the country, and were frequently seen in Knox county. Mr. Buckmaster met them from time to time, but was never molested by either. Mr. Buckmaster was never caught out in any of the well remembered blizzards of 1880 or 1888, but was caught in the open south of Niobrara by one of the severe hailstorms that frequently swept the country, and had his buggy and team badly pelted by the fall of ice, but without injury to himself. Mr. Buckmaster is a member of the Knights of Pythias, Independent Order of Odd Fellows and Ancient Order of United Workmen, and worships at the Episcopal church. Aaron Z. Perrin is one of the most prominent and successful business men of central Nebraska, and is recognized as a public-spirited and useful citizen. He has splendid business qualities and has a reputation for integrity and upright dealing. A portrait of him appears on another page. He was born in Scott county, Iowa, October 4, 1863, sixth of the eleven children of Samuel and Sophia (Roubleau) Perrin. Ten of these children now survive, namely: S. W., of Lincoln; G. F. and S. L., of Sargent; two sons in Cedar Rapids, Iowa; one son in charge of the United States government station at Balabac, Philippine islands; Aaron Z.; Mrs. James D. Courtney, of Omaha; Mrs. Granville Ivers, of Winner, South Dakota; Mrs. William Crinklaw, of Craig, Nebraska. A sketch of S. L., who spells the surname "Perin," also appears in this work. The father was of German descent, born near Cincinnati, Ohio, a civil engineer by profession, and settled in Custer county, Nebraska, where he took a homestead about 1884, dying there in January, 1888. The mother was born in New Orleans, Louisiana, of French parentage, and died in Lincoln, Nebraska, May 13, 1911. Mr. Perrin was reared to young manhood in Iowa, receiving the educational advantages generally given in the common schools there, and in the spring of 1880, came to Custer county, where he spent four years with his brothers on the farm. March 1, 1884, he came to Sargent and took a position as clerk in the general store of J. K. Spacht, remaining with him five years. In the fall of 1889 he took charge of a grain elevator in Sargent. This was put up by a Chicago firm before the railroad went through Sargent, and after buying grain to fill the elevator they hauled it to Arcadia with teams and shipped it from there by rail carrying on the business in this manner for two years. In February, 1891, Mr. Perrin accepted a position as book-keeper for a chain of seven elevators belonging to the Nash-Wright company, remaining with them until July 1, 1899, when he resigned the position and returned to Sargent with his family. By this time the railroad had been completed to the town and he erected a comfortable modern home on a twenty acre farm tract three quarters of a mile north of Sargent, where he has since resided, and where he has set out trees and flowers and made many other improvements. In the fall of 1900, Mr. Perrin, in company with C. W. Parks, purchased the J. S. Spooner stock of hardware and implements, and in the fall of 1906 they were incorporated as the Sargent Hardware & Furniture company. They carry a full line of farm machinery and agricultural implements, and from a small beginning have built up an extensive trade. It is one of the largest and best equipped business houses in central Nebraska. Mr. Perrin was married March 4, 1888, at Sargent, to Flora M., daughter of I. C. and Cynthia Tobias, of that place, and they have had four children, three of whom now survive: Otto, K., a student, in the state university; Clyde W., at home; Marie Blanche, deceased; Ruth Gladys. at home. They are one of the prominent families of Sargent, prominent in social and educational circles, and have many friends. of the state for the deep interest he has always exhibited in the welfare of his county and vicinity he is a thorough western citizen, an enthusiastic admirer and firm believer in the possibilities of Nebraska as a leading state of the Union, and during his residence here has accumulated a nice property, and gained the respect and confidence of those with whom he has come in contact in either a business or social way. Mr. Copley was born in Delaware county, New York, on May 13, 1853. He was the fourth in a family of six children born to Joseph H. and Ruth Ann Copley, all of whom are deceased excepting one sister now living in Colorado and a brother in Kansas. At the age of five years his parents moved to Knox county, Illinois, and there he grew to manhood, receiving his education in the common and high school of Alton, Illinois, and as a young man interesting himself in farming. In 1878 he came to Nebraska, locating in Howard county and remained one year, then came into Nance county and purchased one hundred and sixty acres of unimproved land on section tweny-five [sic], township sixteen, range seven, built a rough dwelling and started farming. Although he had a hard time to get along during the early years, going through all the pioneer experiences in the way of discouragements from failures of crops, etc., he has been successful in the main, and is now proprietor of two hundred and twenty-five acres of choice land, also considerable valuable town property. Mr. Copley is now (1911) serving his fifth year as treasurer of the Farmers' Elevator Company of Fullerton. This concern handled two hundred and twenty-seven thousand bushels of grain in 1910. Mr. Copley is numbered among the earliest settlers in his section, helping to organize the first Methodist Episcopal church and Sunday school in his neighborhood. He is now county superintendent of Sabbath schools. The first church and Sunday school was held in a sod school house, and in 1901 the church known as Pleasant Valley Methodist Episcopal church was erected. On August. 28, 1878, Mr. Copley was united in marriage to Miss Sadie E. Richmond, of Winfield, Kansas, who was a very charming and accomplished lady and a musician of considerable ability. Her death occurred October 26, 1881. Mr. Copley married the second time November 1, 1883, taking as his wife, Fannie M. Ellsworth, of Nance county, who had for some years been a teacher in the public schools. To them were born four children, three of whom are now living, namely: Arthur, who married Olive Sherman and is a Nance county farmer, and E. Marvin, who married Natalie Conard and is now operating subject's farm, and Leila May, living at home. The Copleys have a pleasant home and a host of warm friends. Bohemia has made a liberal contribution the progressive citizens of the United States, a especially in the vicinity of the Niobrara valley, where several colonies settled in the wilderness before the Indian dwellers of the region had, by treaty, given over the surrounding country. Lewis Wlna was born in the town of Pisk, Bohemia, on September 25, 1866, and was but a few months old when his father emigrated to America. He settled in Michigan county, Wisconsin, and his sole cash capital was eighty dollars, which was considered at that time, a high premium and such was the fluctuation of coin in those days, that the loan of it brought him a return of about three hundred dollars. In about the spring of 1871, he came west to Nebraska, settling near West Point. Fremont was as far as he could travel by rail, the balance of his journey being made by wagon. He was met by an uncle who had established a brewery at West Point, and taken to his destination. When our subject's father landed in West Point, he had eight children and eighteen dollars in money, sixteen of which went to the land office in payment for filing on land, the remaining two dollars purchasing a sack of flour. On the day he landed in the vicinity, Mr. Wlna found work cutting wood, while his two boys, Lewis and Anton, carried it into a shed. For this. the lady of the house rewarded them with a piece of cake, which was indeed a treat to them, and which tasted better to them than any they ever ate, before or since. Lewis Wlna was reared at West Point, getting but a limited education, his spare time from work being spent in the local schools. At the age of fifteen he secured a situation in a mill and learned the miller's trade, continuing in the same up to the spring of 1910. In 1884 he came to Knox county, and in partnership with two friends, Messrs. Dusatko and Pavlic, established the mill at Verdegris, which he ran alone after the first year. In 1893 he came to Lynch, built a mill on the bank of Ponca river, and operated it successfully until April 28, 1910, at which time he sold out to engage in other enterprises. During his career as a miller he was confronted with serious obstacles at various times, one season the water running low obliged him to resort to the use of gasoline as supplementary power. Cash was necessary to obtain goods from the Standard Oil Company, and there was none to be had in the country with which to pay, his grinding being taken in toll. Thinking to supplement the natural flow of the stream with artesian water, a small well was drilled in 1900, and a larger one in 1904, which flows through a ten-inch pipe a volume of water large enough to form a large stream. flows a stream of health-giving mineral water from the larger well, of the same temperature and properties as the famous waters at Hot Springs, South Dakota. This resort is a boon to the traveling public, as well as the citizens of the little town, and if "cleanliness is next to godliness", Mr. Wlna has done his full share to humanity as a means of grace. Mr. Wlna was united in marriage in Verdegris, on September 28, 1892, to Miss Amelia M. S. Bartak, daughter of well known pioneers in that locality. Of eight children born to Mr. and Mrs. Wlna, seven survive, as follows: Fred, associated with his father in business; Henry, William, Vernie, George, Alvin, and Anna. Music is a trait strongly developed in the Bohemian race, and it is not lacking in this family, as with his three eldest sons, our subject conducts the Lynch orchestra, consisting of two violins, double bass, and cornet. The class of music which they produce is equal to that heard in orchestras of note in larger cities, and is a credit to the town of Lynch, as well as to the family constituting the organization. Mr. Wlna and his family are devout members of the Catholic church, and he has the credit of having begun the movement which resulted in the erection of their house of worship at Lynch. Mr. Wlna is a charter member of the Royal Highlanders and the Bohemian Benevolent Organization, Z. C. B. J., he being one of the prime movers of the building project by which they erected a sightly hall at the end of the municipal street in Lynch. He helped institute the lodge at Niobrara, that organization dedicating their fine new ball and opera house on June 17, 1910. In political faith Mr. Wlna has been a republican since the campaign of 1888, when he diverged from the political views of his father, who was a strong democrat. A teacher had shown to him clearly the political principles of both parties, and made it plain to him that the republican party was the truly constructive and progressive organization. Alphonso L. Yates, well known to anyone familiar with the personnel of the farming community in Boone county, Nebraska, is now a resident of Albion, where he settled a number of years ago, after having spent a successful career in the pursuit of agriculture in Boone precinct. Mr. Yates is the son of Asa and Mary Yates, born in Boone county, Illinois, on January 17, 1849, and was the eldest of their eleven children, all of whom are now residing in Illinois, except our subject and one sister, who is in Wyoming. The mother died when our subject was a boy, and the father's death occurred in 1874. Alphonso spent his boyhood in Illinois, attending the country schools, spending considerable of his time farming, and also engaged in different business enterprises as a young man. 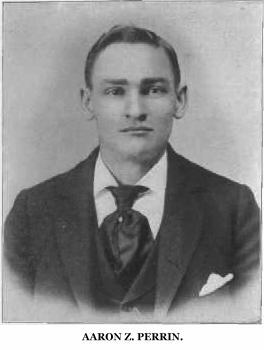 He was married on June 5, 1878, to Miss Retta Cramer, and in the fall of that year they came to Nebraska, purchasing a tract of land on section eight, township nineteen, range five, which remained the home place until 1902, at which time Mr. Yates sold the farm and moved to Albion, where he built a good home which he and his family now occupy. Mr. and Mrs. Yates are the parents of one child, a daughter, Ruby, who married R. D. Childs, they having two children, and also being well known as prominent citizens of Albion. Two sisters of Mrs. Yates reside in California, another in Boone county, Illinois, and these with herself are all who remain of seven children in their family, father and mother both being deceased. Paul Schellenberg is located on section twenty-two, township twenty-five, range one. He was born near Berlin, Germany, in 1875, and is a son of Carl and Fredericka Schellenberg. He received his earlier education in his native country, and when about eleven years of age, accompanied his parents to the United States. His brother, August, had secured land in Wayne county, Nebraska, for the low price of eight dollars per acre, and had made some improvements thereon, the place being purchased by him about 1889. August Schellenberg finds mixed farming a profitable occupation in his part of the state, and pays considerable attention to stock raising. Paul Schellenberg has won the respect and esteem of a large circle of friends, and has a reputation for upright dealings in business affairs. His father died in 1890, shortly after coming to America, and his mother is living with her son, August. After coming to America Paul Schellenberg's father rented land, and Paul remained with him until his death. After the father's death, Paul began working out, which he has done most of the time, although he has rented land to some extent. In 1902, he went to Freemont county, Idaho, and homesteaded a claim, on which be remained two years and proved up on it, after which he sold and returned to Wayne county, where he has resided since. Prominent among the old settlers, although still one of the younger men of the community, paradoxial as it may seem, is Louis Lehman, who has spent his entire life in this county. He has been closely identified with the growth and development of the farming interests in this community for nearly forty years, and is widely and favorably known as an energetic, intelligent, and industrious farmer and citizen. Mr. Lehman was born in Stanton county, Nebraska, in 1870, and is the son of Louis and Molly Lehman, of Brandenburg, Germany, who came to this country several years previous to his birth. They were in Wisconsin about fifteen years, and in 1868, with an ox team, took the long six weeks' trip across the states to Stanton county. They bought a homestead here, and first built a log house, where Louis was born. This same house served as a home for the family for twenty-five years. The country was but thinly settled at that time, and Mr. Lehman enjoyed the life of a true pioneer child. At that time, it was not an infrequent sight to behold deer and antelope on the prairie, not far away. Omaha was the nearest market, and it took a long time to make the trip to market and return. Mr. Lehman call tell many most interesting tales of life as it was then in those early days. In 1900, the subject of this sketch was united in marriage to Miss Martha Wagner, of Stanton county. Four children have been born to them: Edna, Alice, Zelma and Elmer. Probably no citizen of the county more fully appreciates and understands the wonderful transformation of this section, from a wild and uncultivated tract to its present one of thriving activity is an agricultural center, than does Mr. Lehman. He himself has aided materially in its development and is one of the most prominent and prosperous citizens of the community. Prominent among Antelope county old settlers is Charles Wolfe, who since the spring of 1881 has made this region his home and done his share in the development of the agricultural resources of this section of the country. Mr. Wolfe lives in section four, township twenty-five, range eight, and is highly respected and esteemed by all with whom he has to do. Mr. Wolfe is a native of Polk county, Iowa, born November 9, 1861. His father, John Wolfe, came from England to Pennsylvania, about 1830, and died when our subject was very young; his mother, Lydia (Miller) Wolfe, was a native of Germany, and died at the age of sixty-four years; at the time of her death she resided in Neligh, Nebraska. On March 25. 1881, Mr. Wolfe came to Antelope county, and took up a pre-emption claim in Lincoln township. In 1897 he bought his present home in section four, township twenty-five, range eight, purchasing the land from John Cortyou, this farm having been originally the homestead of John Rynor, senior. This land was not much improved, only twenty acres of it being broken when our subject took possession. He now has sixty acres of it broken, and raises corn and oats; and also has five acres set with trees. Mr. Wolfe was united in marriage to Miss Silvia Viola Kimes, June 6, 1887, and Mr. and Mrs. Wolfe have had the following named children born to them: Archie, Grace, and Lue; and Alta, who died in 1890, in Oklahoma. She was the eldest child. Mr. Wolfe is fond of hunting, and in 1891 he with his wife went to Oklahoma on an extended hunting trip, and were gone three years, during which time they thoroughly enjoyed their outing and returned home well satisfied with their efforts. John Mumm, a retired farmer, and a highly respected citizen of Plainview, first came to Nebraska in 1885, reaching Antelope county February 20, and purchasing a quarter section of school land in Crawford township, seven miles southwest of Plainview. In 1895 he sold this and bought two hundred acres in the same township, within two miles of Plainview, which he cultivated until 1903, in which year he retired and for three years resided in Plainview before actually engaging in farming again, which he did, in partnership with his son, Jacob; from 1906 to 1909, when the latter opened a store at Copenhagen, a station on the Burlington railroad nearby the farm. Mr. Mumm then sold the farm to his eldest son, John H., and again became a resident of Plainview, to take life easy the remainder of his days. Mr. Mumm was born in the village of Hohn, Schleswig-Holstein, a province of Prussia, June 23, 1842. His father, Claus Mumm, died in 1844, and the mother, whose maiden name was Kate Storm, died three years later, leaving the boy to the care of strangers. His opportunities for school were very meager, and he early became inured to a life of toil. In 1865 he decided to cast his lot in the new world, and sailed from Hamburg on the "Germania," in the early days of November, landing in New York after a voyage of twelve days. He then went to Woodford, county, Illinois, where he found work during the rest of the winter, and from there be found his way to Kankakee county, Illinois, where for several years he was employed at farm labor.